(Nanowerk News) The Freiburg researchers Dr. Andreas Schreiber and Dr. Matthias Huber, the head of their research group Dr. Stefan Schiller, and their colleagues at the University of Constance have developed the concept of protein adaptor based nano-object assembly (PABNOA). 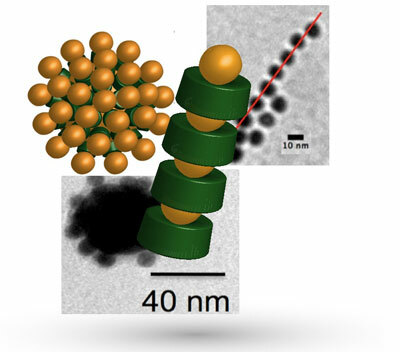 PABNOA makes it possible to assemble gold nanoparticles in various structures with the help of ring-shaped proteins while defining the precise distance between these particles. This opens up the possibility of producing bio-based materials with new optical and plasmonic properties. The field of nanoplasmonics focuses on miniscule electromagnetic waves metal particles emit when they interact with light. The principle behind the production of these materials could also be applied to develop nanosystems that convert light into electrical energy as well as bio-based materials with new magnetic properties. The team published its findings in the journal Nature Communications ("Molecular protein adaptor with genetically encoded interaction sites guiding the hierarchical assembly of plasmonically active nanoparticle architectures"). Schiller's team is using tailor-made proteins as building blocks to assemble nanosystems with new physical, chemical, and biological properties. The sustainable and resource-conserving production of these proteins occurs in processes like the natural energy and material cycle of cells. To this end, the team is working on equipping bacteria with additional elements - such as enzymes, transporters, switches, and organelles, the organs of the cell. In the future, the scientists hope that these elements will extend the range of functions of the cell to enable the sustainable production of the desired nanosystems with a minimum of resources. The same principle could also be used to produce basic raw materials for the chemical industry. "Methods like this are indispensable for the successful transition of our economy to a sustainable and resilient bioeconomy," says Schiller. Stefan Schiller is a research group head at the Freiburg Center for Systems Biology (ZBSA) and a member of the Cluster of Excellence BIOSS Biological Signalling Studies of the University of Freiburg. The research was conducted in cooperation with scientists from the University of Constance. The project is receiving funding from the Baden-Württemberg Foundation within the context of the research network "Functional Nanostructures."